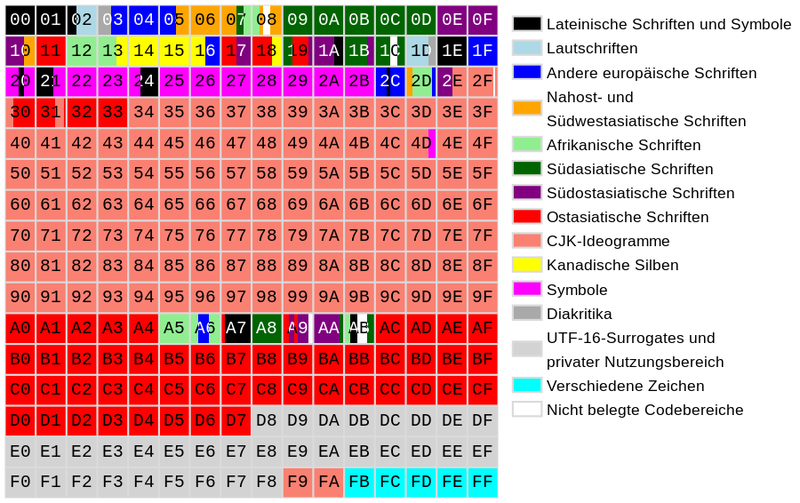 An approximate idea of where the different character blocks are found in Unicode, whether further ahead or further back in the list, is provided by some overviews. 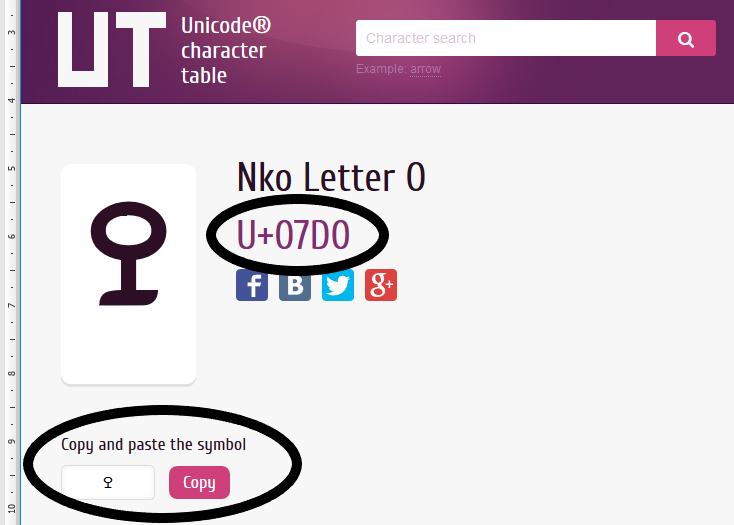 Unicode (hexadecimal), unicode-table.com (Sa•design 2017). CC: AN 2018, BY-NC-SA. In the table of "Sa•design" you can also find the characters you are looking for sorted by blocks of related characters of specific writing systems. If you click on the respective letters within these blocks, the corresponding hexadecimal code for Unicode appears. The code can be used to enter the character, e.g., into your own Word document. Alternatively, there is the option of inserting the character into your document via "copy and paste". Unicode (hexadecimal), with „copy and paste” option, unicode-table.com (Sa•design 2017). CC: AN 2018, BY-NC-SA. 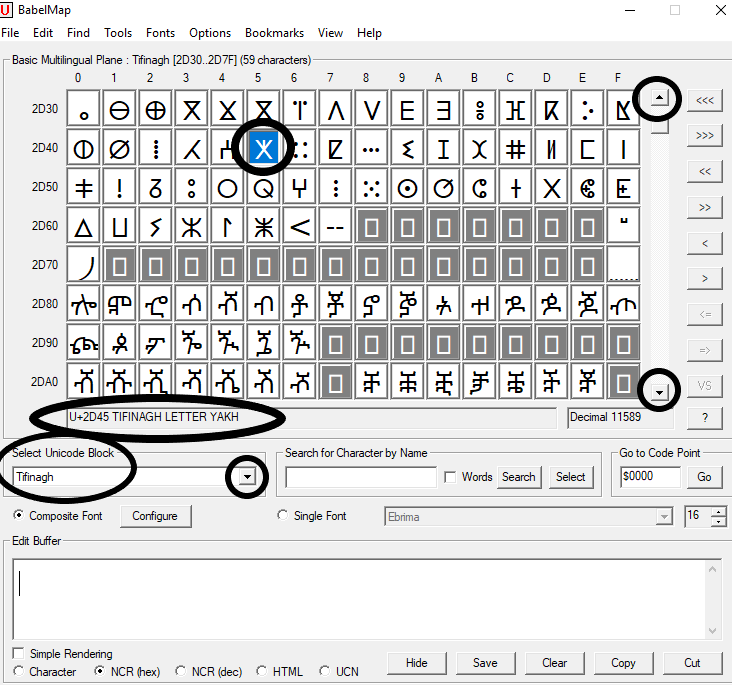 Unicode (hexadecimal) in BabelMap Version 11.0.0.1, 2018. CC: AN 2018, BY-NC-SA. 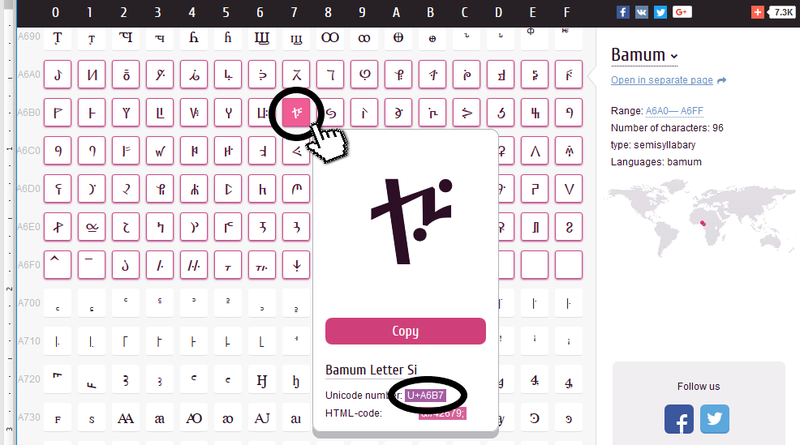 The online tool "BabelMap Online (Unicode 11.0)" also offers a good alternative to the program version of BabelMap for the hexadecimal codes. In ScriptSource (by SIL), too, you can search for the hexadecimal codes. They are arranged there alphabetically, according to languages or writing systems. An alphabetical list of diacritics based on Latin script is also available on other websites. 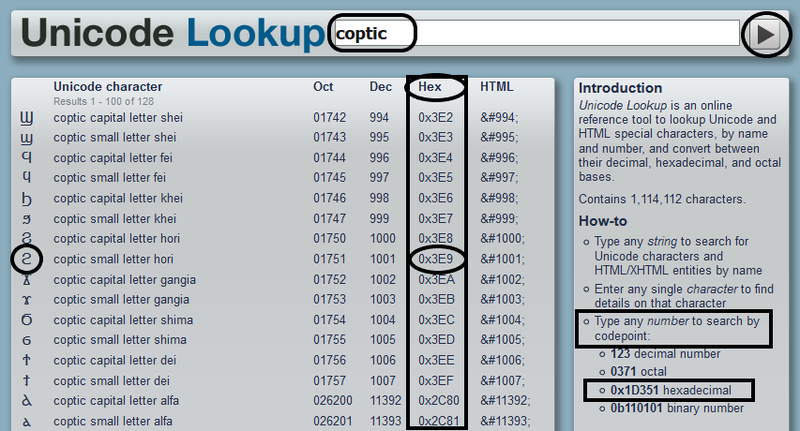 Unicode (hexadecimal) in Unicode Lookup (2009), unicodelookup.com. CC: AN 2018, BY-NC-SA. On the website of InternationalPhoneticAlphabet.org (2017), you can also find the codes for the International Phonetic Alphabet (IPA) in hexadecimal form. The hexadecimal notation is placed behind the respective character’s glyph, in the third column, under "hex". If you have found the characters listed in these tables, it is best to use the combination "U +" to insert the corresponding hexadecimal code into your Word text. You let your cursor stand right next to the hexadecimal code, and then simultaneously press the keys "Alt" and "X". If you release both keys, the desired character appears. Example: If you have found the first character in the second line, "hu", in the Unicode table for Amharic, you will find specified there the code "1201". Now write "U+1201", and afterwards press simultaneously the keys "Alt" and "X" (in the German version, "Alt" and "C"). If you release the keys, the character ሁ appears. The method works in both directions. So you can switch back from the glyph to the code, again, by simultaneously pressing "Alt" and "C". Note: The "U+" is used (for 16 and 32 bit encodings) to indicate in which order ("byte-order mark (BOM)") the bytes are encrypted. For applications based on UTF-8, you usually may omit it, since there is only one possible way of ordering anyway. Further information can be found at Unicode 11.0.0, pp. 40-41. The input method "Alt" + "X" works especially under Windows, but also in some other applications. For Linux and Mac, there exist other input options. While US applications usually continue working with the input variant "Alt" + "X", this variant does not work anymore, from Word 7 onwards, in the German versions of Word. Here, the input method "Alt" + "C" has to be used instead. However, the "Alt" + "X" form of input sometimes continues to be used in dialog boxes.